We all love a good night out on the town with our partner. Thankfully, it isn’t impossible to have a great time at home. 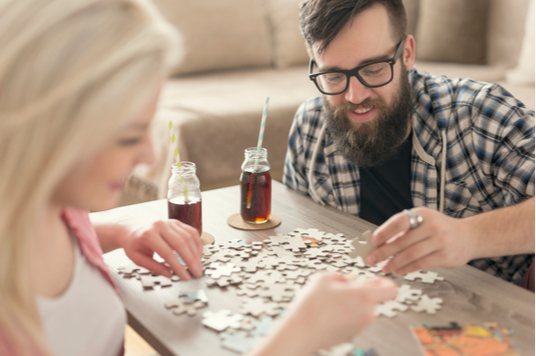 Here are some handy and fun at-home date night ideas to explore. This is one of the easiest date night ideas to execute. First, put the kids to bed. Then pop some popcorn, cuddle up under a warm blanket on the couch and load up Netflix or another streaming service. This is the best time to binge on that show you watch together. Cooking at home for each other is a delightfully romantic date night activity. And it isn’t limited to just dinner either. You can make a gourmet breakfast with all the trimmings, a super lunch or skip it all and head straight for some decadent dessert with cupcakes or even a multi-layered cake. You can each pick a recipe to make for the other or have a build-your-own pizza or burger night. Break out the board games and open up a bottle of wine. Tonight just went into game mode. If board games aren’t your style, you can pull out a deck of cards and learn Gin Rummy or have a few rounds of strip poker. Go Fish is a classic and video games are still games. Have a marathon round of Mario Cart—loser does the dishes. This one takes a little bit of preparation in the form of buying a couples’ quiz book or printing out some fun quizzes. If printing isn’t an option, then look them up on your phone or tablet and share the results with each other. With this date idea, you can learn about each other’s personalities and preferences in the random realm. Libraries are the broke bookworm’s best friend. Take your sweetie to a library and pick out a book for each other; then brew a cup of coffee and curl up for a quiet afternoon of reading by the windows. You can mix things up by reading aloud to each other or getting a cookbook to try some new recipes. The sky is the limit where books are concerned. Bake some cookies and pull out that 1000 piece jigsaw for a fun challenge. If there is no puzzle available, Sudoku or a book of crossword or word search puzzles can substitute. Do a timed challenge for who can find the most words or get a Rubik’s cube and scramble it for hours of fun. Pack a yummy picnic of sandwiches, leftover pizza and some fruit with some bubbly and plastic glasses, grab a blanket and head to the great outdoors via your backyard. After you’ve eaten, lay back and watch the fluffy clouds go by or do some star-gazing if it is dark out. Take a special trip to the store for some necessary items and then host your very own tasting party. Have a cheese or fruit plate to cleanse the palette and open two or three bottles of wine or gourmet beer. If alcohol isn’t your thing or you want to mix things up, have a chocolate tasting party with several new varieties or splurge on the weird ice cream flavors and discover a new favorite. We could all use a little trip to the spa so bring the spa home. Soak in a tub of soothing oils with scented candles then take turns giving each other massages before rubbing some hydrating lotion all over and maybe do a facial mask and a mani-pedi as well. Pick a theme (Italian, Spanish, Christmas, Chocolate, Tuesday) and certain the evening around it. For example, for an English theme watch some Jane Austen classics while sipping tea and nibbling on little sandwiches before having a classic English supper of roast and potatoes with good beer. Get creative and maybe involve the kids. Settle down with a copy of the Guinness Book Of Records and pick one to break. Spend the whole evening trying to break it or challenge each other to see who can get the closest to breaking it. If you succeed, you’ll have something to boost about at the next family reunion. Drag the tent and sleeping bags out of storage and make a campsite in the backyard (complete with s’mores) for an adventure. If it is too cold, build a fort in the living room and curl up with cozy blankets and all the pillows you own. Substitute whipping cream and wine for the s’mores. Pretend the electricity is out for the whole evening (except for the heater during the winter of course). Make and eat dinner by candlelight (or get take-out), then talk to each other, do a puzzle or cuddle by the fireplace. You can also explore the house with flashlights and play hide ‘n seek. Or sculpt, draw or glue, etc. Basically open some wine and have an art night. Buy some dollar store canvasses and paints, look up YouTube tutorials and get crafty or paint each other’s portraits. 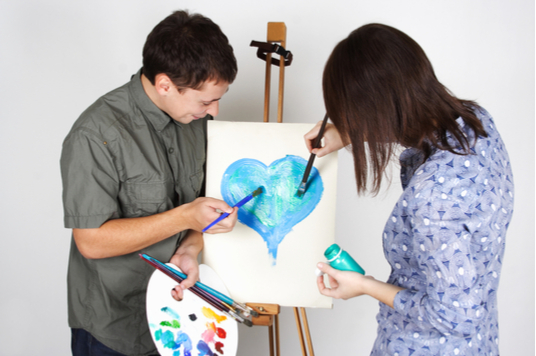 You could decorate coffee mugs for each other or learn a new skill like sewing or knitting. If that doesn’t appeal to your mate, get some body paint. Hide some treasure around the house and then send your sweetie off on a scavenger hunt to fund everything for an exciting evening. Have each gift tie in with the next till they find the last one in the bedroom, of course. You will want to ship the kids off overnight for this one. For a really fun night, make or print some special menus and order the perfect delectable meal. Be sure to dress up for the occasion. If all else fails, put on some music and do a strip tease.